My special thank to Suchismita didi for this recipe of Rasmalai whom I met 7-8 years back through some social networking site. She has immense expertise in all types of Indian cooking and an equally good soul too. She has inspired me to experiment with all the recipe she shared with me. 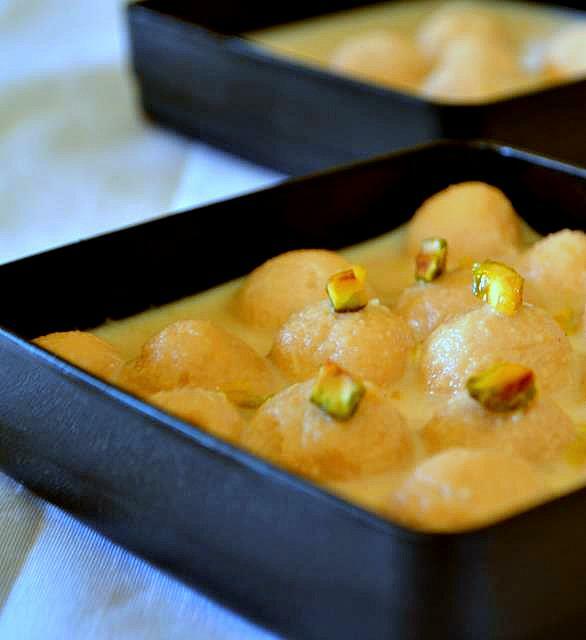 Sometimes I don’t belive that I am making Rasmalai or Sandesh, who couldn’t make 'daal' properly ten years back. So when I started my journey of cooking, just used to follow her blindly and the outcome was always great. Now I'm confident enough that I can make a new experiments with any basic recipe. All the credit goes to her teachings. 4. Put it over a soft cotton cloth / or a cheese cloth (if you have any). Let all the water drain away. 5. Now put this cloth with the chhana under cold running water for 2-3 minutes. This will help to remove the smell of lemon. 10. 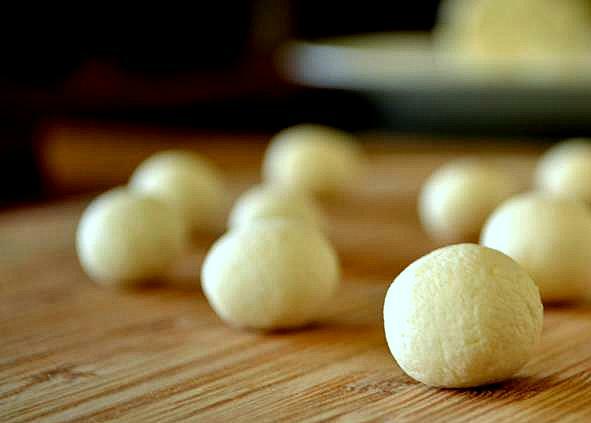 Now from this dough make some big pea sized round balls, approximately 30 to 35 small / baby rasgulla you can make with that dough. 11. Take a big pan with lid. Put the water and sugar to boil for some time. 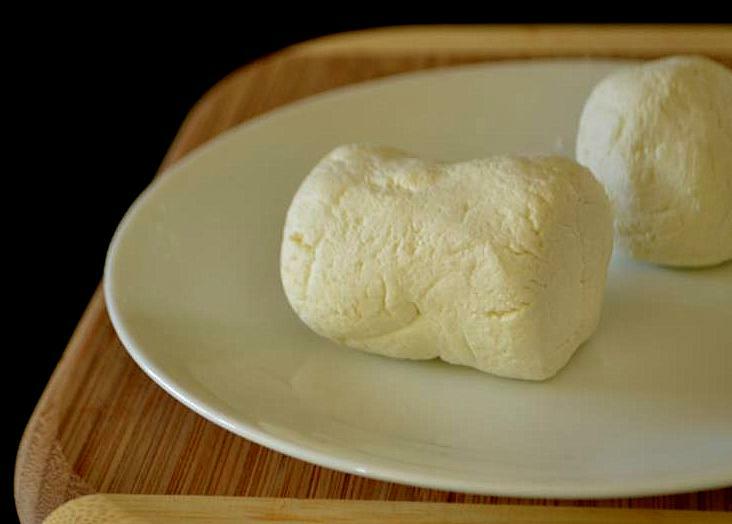 After 5 minutes, place the cottage-cheese balls into the syrup carefully. Cover it. Turn your stove on to a medium heat. Let it cook. 14. In another pan, boil the one liter of milk at low flame, stir occasionally to prevent it from burning at the bottom. Once it becomes half in quantity, add date palm jagerry, add the balls in it along with cardamom powder. 15. Let it simmer for couple of minutes, check the sweetness and turn off the gas. 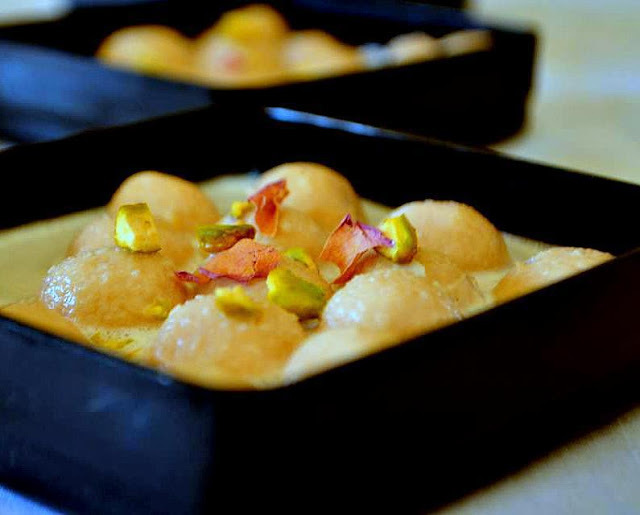 Your Angoori Rasmalai is ready!! Serve cold with a sprinkling of chopped pistachios. 16. 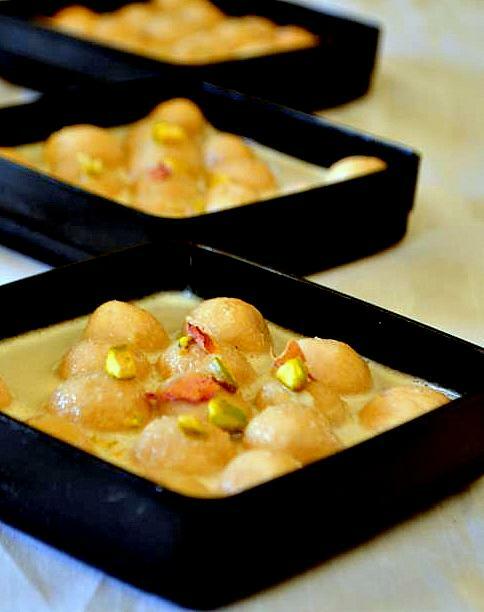 Note: In the same process you can make the Rasmalai where the cheese-balls will be big size and flatten. Recipe will remain same. Again you can skip the jagerry part with sugar.